Apple FM is very proud to be broadcasting the Gardener’s Question Time feature at this years Taunton Flower Show in the Demonstration Marquee on Friday 5th & Saturday 6th August 2016. Hosted and Chaired by Phil Hodgson from your very own Award Winning Community Radio Station, the feature will be broadcast LIVE on both days of the Flower Show from 2-3pm to the whole of the Taunton Deane, so even if you aren’t able to get to the event you don’t have to miss out on the wealth of knowledge in our panel of experts! 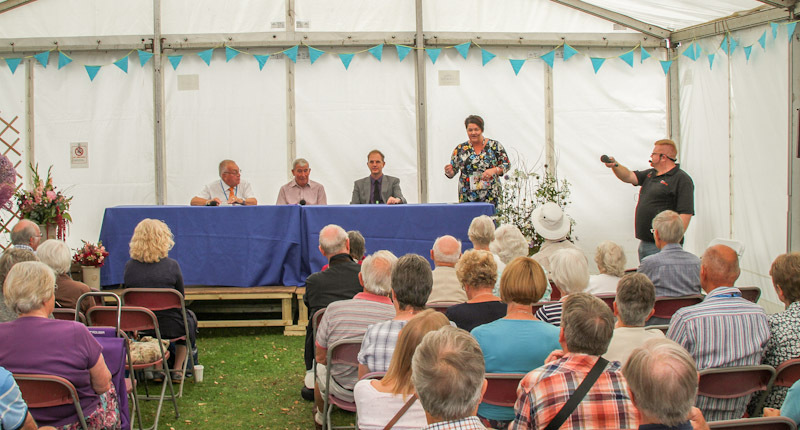 The Heroes of Horticulture on Friday will be the wonderful BBC Gardeners Question Time panelist Pippa Greenwood, Taunton’s own Vic Verrier MBE & Andrew Pitman from Monkton Elm Garden Centre. In the Saturday edition Saturday we have RHS multi-award winning Landscape Gardener Darren Hawkes from Darren Hawkes Landscapes , Vic Verrier MBE & Andrew Pitman again. Have YOU got a gardening problem…? For the first time this year Apple FM are inviting questions in advance from members of the public that could be put to the panelists over both days. Unfortunately we can’t guarantee that every question sent in will go forward to the panel, but a selection of the best and most interesting questions will be posed to the experts in between the questions asked live in the Demonstration Marquee and you’ll be able to tune in on 97.3FM on your radios in the Taunton Deane area, online here or via the Apple FM App here. So do you have a droopy Delphinium? Are your Onions ‘Orrible? Is your Acer not looking very “Ace”..? If you are able to include a photo or two then that would be potentially helpful, too! Find more information on this from The Taunton Flower Show website here.